Hundreds of special invitees got to experience a “Wonka-esque” inaugural ride on North Texas’ new commuter rail line, complete with golden tickets and enthralling views from the line’s 27 miles – nine stops and three cities – from Fort Worth, North Richland Hills and Grapevine to Dallas-Fort Worth (DFW) International Airport. Jacobs served as program manager for the new TEXRail line, which officially opened in January. By the end of the first year of operation, Trinity Metro’s new line is expected to serve more than 8,000 daily riders. By 2035, nearly 14,000 riders are projected to ride each day. During the past two decades, sustained growth in Dallas and Fort Worth has increased travel demands along the major roadways within the TEXRail corridor. Existing and committed roadway improvements have not kept pace with traffic volume, resulting in increased congestion and air pollution. 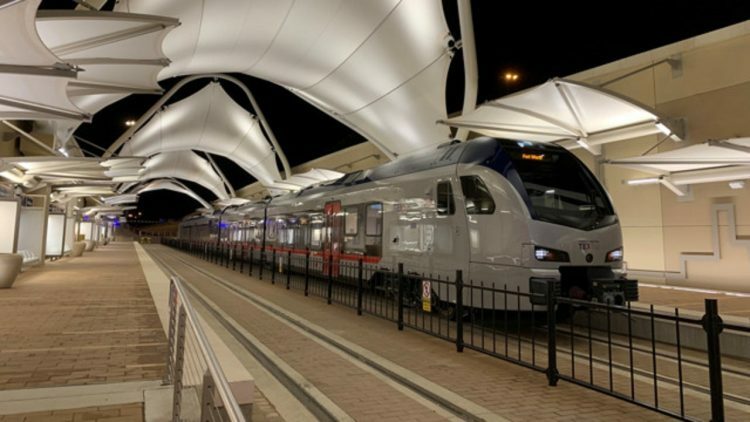 TEXRail is one of several transit improvements aiming to address these issues and others in the greater Dallas-Fort Worth metro area, the fastest-growing U.S. metro area. In downtown Dallas, Jacobs is partnering with the North Texas Council of Governments to address growing high-density conditions by exploring options for an automated transportation system to better connect and mobilize the thriving population; and we’re also serving as principal design consultant on Dallas Area Rapid Transit (DART)’s 26-mile Cotton Belt commuter line, which, when complete, will connect with TEXRail for a smooth journey throughout the metroplex. And speaking of smooth, during the TEXRail’s free trial period in its first 22 days of operation, nearly 100,000 riders hopped aboard. Each TEXRail car holds 229 seats with a total capacity of 488. As an articulated train, it’s easy to walk between cars during the ride – an end-to-end commute of 52 minutes. Car features include USB charging stations, seatback trays, overhead luggage storage and even a designated quiet car. The train also offers level boarding, making it easy for passengers with bikes, strollers, rolling luggage or wheelchairs. Due to the excitement around the line and its impressive initial ridership, Trinity Metro is already looking into expansion plans. Since the initial 27-mile TEXRail line came in under budget, there’s potential to use the funds for future expansion routes that could serve the Fort Worth Medical District and Texas Christian University. Jacobs has more than 8,000 rail and transit professionals worldwide with the right mix of engineering, regulatory and business expertise who thrive on working with clients to design and manage their most challenging capital improvement projects, hone vehicle and facility assets and put technology and safety programs into practice that keep people on the move and enhance the rider experience. We deliver safe, efficient, constructible, operable and maintainable transportation solutions that provide essential mobility for commuters, families, students, older adults and persons with disabilities.